The Second Season group will be having a dinner/movie night out. The Second Season is a group of individuals who enjoy participating in activities (age 55 or older) in our congregation and in the community. 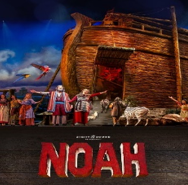 We will meet at BJ’s restaurant in Gainesville for dinner at 5:00 pm and proceed to the Regal Theater for the 6:30 pm viewing of Sight and Sound’s “Noah”. Cost of the evening for both dinner and movie is $30 (pay at the event). See the Connections insert to sign up.